Hi All! I haven't introduced myself yet, so I guess I should do that first. I'm Danielle and I have been knitting for a little over a year. I've been scared of fair isle knitting (although I can knit both English and Continental), so I decided to make some fair isle mittens. 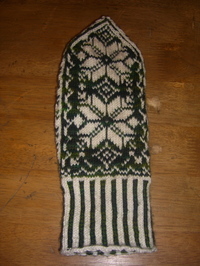 I selected the Nordic Mittens from IK Winter '04 and cast on Friday afternoon. I think I made a mistake, a good one though. I think I should have picked a harder project. Silly me. I've already finished the first mitten. So, I'm already planning other projects I can do in this time. Anyone have some advice on relatively easy fair isle that will still take me a while to complete? the opening ceremonies at doyle's were a lot of fun. the team boston organizers had done a marvelous job with the buttons and the torch and the organizing. they've won the gold medal in my book. i don't know how many boston area knitters were there, but we did fill up two long tables and caused enough of a raucus to change the image of knitters for doyle's patrons forever. unfortunately i have no pictures, but i'm sure there will be pictures surfacing soon enough. because of the nature of my project, with all of the little tiny skanks of yarn, i ended up not starting with the lighting of the olympic flame, but rather the evening chatting and finishing up my latest commuter project: a neckwarmer made with 2 skeins of noro kujaku in a tiny cabled rib pattern. however, on day one, i got straight to work. i organized the little skanks by color, and put them into labeled baggies. then i got to knitting. i'm not in love yet. i'm not sure i even want to go out on a second date, but i'm not getting any younger, so i might want to give it another chance. False Start, but then, success! Hi, I'm Amy, and I live in South Grafton. I joined Team Boston because there's not a Team Worcester. Boston's close enough, though. For my challenge, I wanted to figure out how the heck to post here... just kidding. I'm doing Knitty's Branching Out, my first attempt at lacework, in Frog Tree's alpaca sport weight (the color is #46, and it's like olive-ish). I'm told this pattern is a good start because it incorporates every annoying stitch anyone would ever need to do lacework. I won't bore you all with the details, but I suffered a serious setback yesterday - wrong yarn, wrong needles, ugh ugh ugh. But now, I have the right yarn, and the right needles, and I'm back in the saddle again, so to speak. You can read about my trials and tribulations in my knitting olympics journal. Well, some athletes try to perfect a certain technical event, others try to medal in many events. I am going for the latter, trying to reduce my stash for a good cause of the Dulaan project. I finished my first KO hat today (big yarn, big needles). Was anyone else wondering whose i-Pod was used for the opening ceremonies last night, I like my Gloria Gaynor & Van Halen as well as the next knitter, but I guess the "olympic-ness" escaped me. I was so excited to start the KO, but due to dental issues & being at the oral surgeon's, I couldn't start until last night. However, I am flying along! I did slightly change my mind about my project; after a week of debating back & forth & back & forth, I finally decided to change my mind only slightly. I honestly felt that stripey toe up knee high socks weren't going to be much of a challenge, so I decided to do toe up, fair isle knee high socks instead, or at least, as far as my yarn will go. I think I have enough, because all of a sudden it dawned on me that my box of tapestry yarn should be just about the same gauge as the other yarn I'm using, and still 100% wool! woo hoo! I'm doing it in shades of blue & purple, with a few odd shades thrown in for constrast, and as always, they are dramatically mismatched, my favorite socks! They are coming along very, very fast, and I am so in love! I'm using a fair isle pattern from the book "Sensational Knitted Socks" - I wanted a fair isle pattern easy to memorize, something that looked a little more complicated than it was in reality, and something that would look good with the lots & lots of colors I was planning on using. So the final decision was the last fair isle pattern in the fair isle section. I am making them toe up, on double points, both socks at the same time on different sets of points, and 5 needles a piece, all of my favorite/usual way of knitting socks. To be different, I am planning on making an hourglass/short row heel. I don't normally do this! I think I've made *one* pair of socks, ever, with that type of heel. Have a great time at the opening ceremonies, everybody. I made other (knitting) plans before joining the team, so I won't be able to make it. the opening ceremonies have begun in turin and i'm ready. and the moment you have all been waiting for, it's time to announce the winner of my olympic event poll. so the color on color scarf it is. i'm psyched. because this was the project i was hoping for. those of you who voted for charlotte's web. you know i don't think this is ever going to happen. i'm sorry. for those of you who voted for the mess in my head...thanks for your faith in me. the mess in my head is called just that , because well it's a mess. but the mess will get made some day. so i've got my materials together. i may need to purchase a needle or two (this pattern calls for 3 32in size 8 circular needles. i have to reread the pattern to see if that's really necessary.) i need to organize the tiny little skanks. but even if i can't cast on tonight (i'll be at doyle's and well, i don't drink and knit), i'll get on the stick (get it! on the stick!) early tomorrow morning. I think we must all be lunatics, and I totally support the lunacy. The Knitting Olympics has taken on this Very Crazy (in a good way) life of its own and of course, I jumped into the fray. Now, luckily for me, I live in proximity to tons of fabulous knitbloggers and fellow Knit Athletes, and well, we're totally codependent in our crazies. On the left we have my first finished socks of 2006. Koigu KPPPM, color #114. These socks were supposed to be for me, but they are too big. I mean, there is no denying that these socks do not fit me. You know what that means, don't you? It means that I've finished my first Christmas 2006 FO! Ha! Ha! Ha! Ha! Ahem, sorry. Next to my first Christmas 2006 FO (ha! ha! ha! ha!) is a 1 x 1 rib scarf I made for myself using the skein of Woolarina handspun that Lolly gave me last May when I went to visit her for Maryland S&W. It goes with just about everything, I love it vey much - and what better way to use a Lolly gift than in a scarf! Thanks, Lolly! I also finished knitting all of the body bits and pieces of my Ribby Cardi, but the blocking and finishing will have to wait until after closing ceremonies. But I made progress! Progress!!!!! Now, my Olympic Challenge seems modest in comparison to some of you crazies, but still, I feel a little woozy when I think of everything that could go wrong with my project. See, I'm knitting socks for Mike. And he has enormous feet. Not long - but wwwiiiddddeeeee. And I've lost the band for the yarn I am using, so it is possible that there May Not Be Enough Yarn and that I May Get to the Toe of the Second Sock and Not Have Enough Yarn. My plan is to knit the first sock, not weave in the ends, see how much that first sock ways and then weigh my skein to see if there's enough to complete the second sock. If there is not enough, I will rip the toe of the first and do the toes of both socks in a different yarn. Of course, there are still Very Many Things that could go wrong - but I have at least a rudimentary plan and with that and my wits, I am forging ahead. Did I say you all were crazy? Maybe it's just me. I've got my skeins wound into yarn cakes and my pattern copies so I can scribble at will. All I've got left to do is swatch this morning and I'll be all trained and ready to start my event. I'll be attempting the Fanning the Flame mittens. I've seen these done in a two color version that was stunning so I'll be attempting to reverse engineer and suss out how they did that. Much frogging may ensue. Good luck everyone!